It is clear from the preceding discussion that increasing the pulse number to six greatly improves the performance of the converter. The ac line current has only odd harmonics and the value of g increases to 0.96, indicating that the fundamental content is 96% of the total rms value of the current. 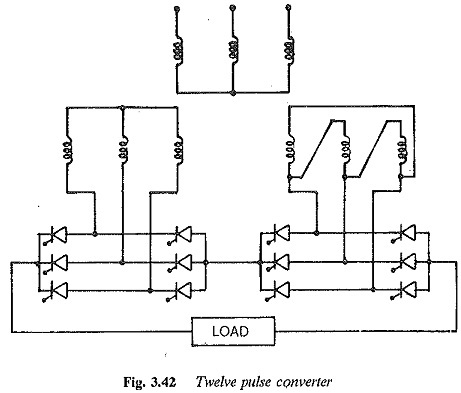 A six-pulse converter is obtained by suitably connecting two three-pulse converters. The idea can be extended to increases the pulse number of the output volt­age to 12 or 24 by suitable interconnections of six-pulse converters. 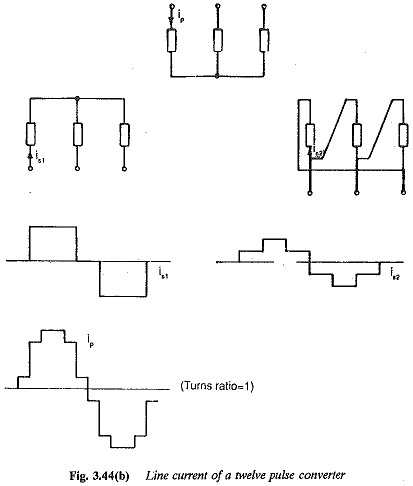 It can be shown that connecting two six-pulse converters with 30° phase displace­ment results in a Twelve pulse converter having an input current in which the lower fifth and seventh harmonics are absent. Also, increasing the pulse num­ber decreases the output ripple which results in a reduced layout of smooth­ing inductance. The power factor improves, consequent to the improvement of g.
A Twelve pulse converter, for higher voltage applications, is obtained by intercon­necting two six pulse converters, as shown in Fig. 3.42. The input voltage to the converters should have a phase difference of 30°, which can be achieved in two ways. 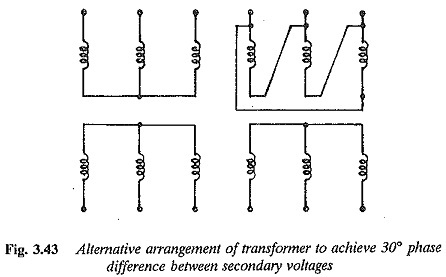 The primary of one transformer is connected in star and that of the other in delta. The converter transformer has two secondaries, one of which is con­nected in star and the other in delta. These connections are depicted in Fig. 3.43, 3.42. 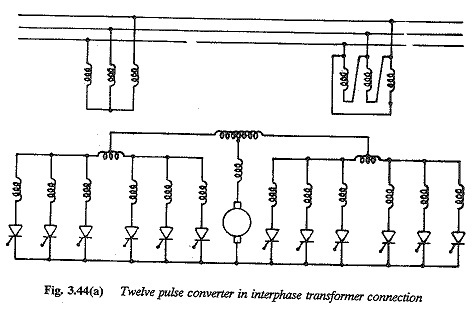 Twelve pulse converters are also obtained by connecting two six pulse convert­ers with an interphase transformer through another interphase transformer. 12 pulses are obtained due to the phase difference between the instantaneous values and output voltages of individual converters. The additional interphase transformer has almost the same design as other interphase transformer. The connections are shown in Fig. 3.44. Sometimes the advantages of increasing the pulse number are offset by the complexity of the transformer connection and by the difficulties of maintaining balance in the system. This happens when two Twelve pulse converter are interconnected to form a 24 pulse one. Such difficulties do not encourage increasing the pulse number beyond 12 or at most 24.